There’s more than one way to skin a cat, so the saying goes. And there’s also more than one way to bet on a horse. That one’s less graphic, so let’s focus on that. This post will show you how to place an each way bet on a horse race. Placing an each way bet is easy, you just need to follow a few simple steps. Before that though, what exactly is an each way bet? An each way bet is two equal bets that are combined to make one bet: a WIN bet for the horse to win, and a PLACE bet for the same horse to finish in one of the places. This is where the term ‘each way’ comes from. The places are usually the first 3 or 4 horses to finish depending on how many runners there are in the race. To find out more, read our full post on each way betting. This example is based on placing an each way bet on Betway. Because each way betting is mostly done on horse racing, that what you need to check out. 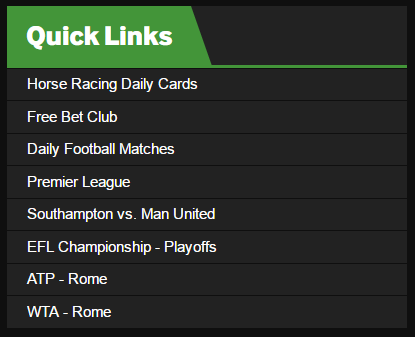 To do this, click ‘Horse Racing Daily Cards’ in the ‘Quick Links’ section. You’ll find this on the left hand side of the landing page. This is the dedicated horse racing page. Click on ‘Today’ in the middle of the page to see today’s races. Scroll down the page to see the race meetings and times. and the number of places paid out. They’re also offering ‘Enhanced Place Terms’ of 1/4 odds for horses that finish in the first 3 places. There are 10 runners in this race so normally the place odds would be 1/5. For more information on places and runners, check out our full guide to each way betting. Click the price button and a bet slip will appear on the right hand side of the screen. Enter you stake (the amount you want to bet) in the empty box. I’ve entered £5.00. 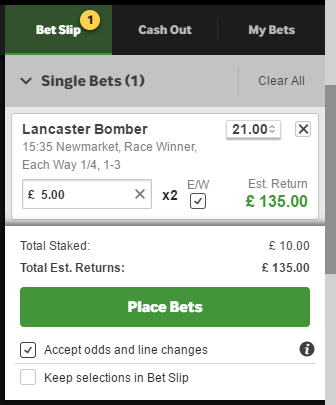 Because this is an each way bet, there’ll be a tick in the E/W box. If it isn’t, just click it. The ‘x2’ indicates that the bet is now made up of 2 x £5 bets: 1 x £5 bet to win and 1 x £5 bet to place. In other words, your total stake is £10 (£5 each way). The total estimated returns of £5 each way, at odds of 21.00, are £135. They’re only estimated because the exact amount depends on the outcome of the race. If the horse wins, you’ll get paid out on both the win and place parts of the bet. In this example, I’ll receive £135 in returns. However, if the horse doesn’t win but still manages to place, you’ll only get paid out on the place part of the bet. Click the ‘Place Bets’ button and a confirmation message will appear. 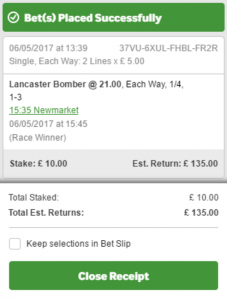 There you go – now you know how to place an each way bet. OddsMonkey can show you to take each way betting even further to boost your profit potential. Find out more when you sign up today! ◂ Can you beat an online casino?